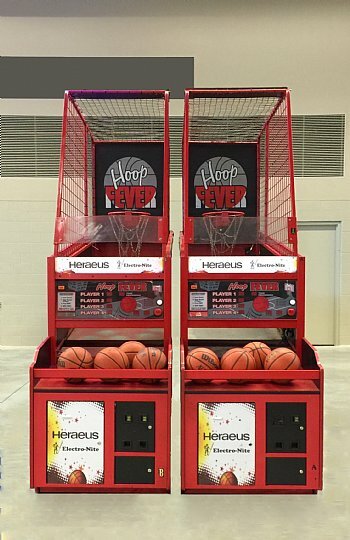 Hoop Fever is an arcade basketball game rental that allows participants a programmed amount of time to shoot basketball at a stationary backboard. The duration of time that can be programmed for this arcade basketball game rental is between 20 to 99 seconds. The suggested duration of time for each participant is 40 seconds. This time can be modified depending if Hoop Fever arcade game is being used at a brand activation or trade show where throughput is vital or a corporate event where a competition that is based on 60 seconds of play on Hoop Fever is necessary. No matter what duration of time is chosen, when the participant makes a successful shot, Hoop Fever arcade game records 2 points until the last 10 seconds of play. In the last 10 seconds of play, each successful shot on this arcade basketball game rental records 3 points. Hoop Fever has proven to be a great choice as a trade show booth traffic builder when the booth size will accommodate this item. 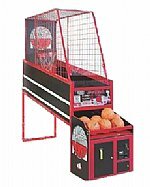 This arcade basketball game rental is quite versatile for a variety of type of events due to its ease of play and how it appeals to both genders and individuals of all ages. 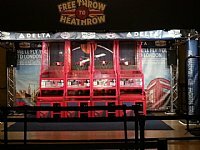 As a trade show booth game rental it offers numerous branding options including the sides, the front, the backboard and the back of the Hoop Fever. 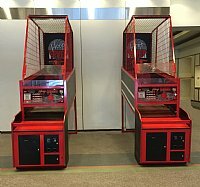 Additionally, it can be utilized as a trade show booth game rental where the attendees have to come into the booth to receive a token from trade show booth staff to activate the game. 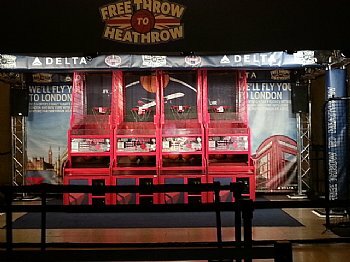 Once the game is over, the participant's score can be recorded by trade show booth staff to be a part of an ongoing competition to win a promotional giveaway. If interested in branding the Hoop Fever arcade basketball game rental, contact one of our event specialists at 1-800 WOW-1196. I was able to catch up with Joe before he left Atlantic City. Very pleased with the entire operation. Rafael was a tremendous asset and incredibly helpful throughout. 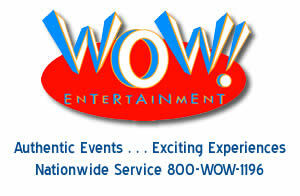 I would definitely recommend WoW as a vendor for future projects in NJ and beyond. Thanks for all of your support, and again our thanks to you and your team!